The global magazine for the plastics recycling supply chain. Published bi-monthly, it covers developments in: recycling plant; compounding; size reduction; separation and sorting; melt filtration; additives; and key end-use markets. 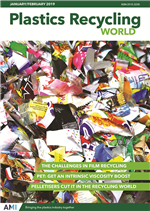 Plastics Recycling World is a digital magazine from Applied Market Information that is specifically written for all companies involved in the conversion of plastics waste to recycled polymers. Coverage includes the latest technology for shredding, separation, washing, sorting, processing, filtration, compounding, pelletising, plus additives, inspection and ancillaries.